In this article, you are going to be educated about the 5 best VR headsets in India of mid-range. But, before we check out the list, let’s talk a bit about VR and related terms. VR stands for Virtual Reality which is a computer-generated simulation of 3-dimensional images or environment which can be interacted in a real way by the person using special equipment, known as VR Headset. So, VR Headsets are special equipment also known as a heads-up display (HUD) that allows the wearer to interact with the computer-simulated environment just like everything is happening for the real. About one or two decades ago, the idea of virtual reality would likely give ambiguous information. But, things have been changed, and it’s no longer a foreign thing. Today when VR headsets are gracing the store shelves in different specifications and designs. And you certainly won’t like to be left in the woods as you’d want to spice up your gaming. In fact, you can enjoy the best virtual reality experience in watching movies as well. When you wear it, and play a game or watch a movie, you can actually feel that you are a part of that game or the movie, and you can look around just like you do in real life. Since VR headsets are being the ubiquitous thing in the market, and people are buying and using them, it is the best time you also try your hands on the best one in the market. But, without prior experience, it is always tough to find the best product. That is where; beast5.in helps, you choose the best by listing the best 5 by doing a lot of R&D. In this article, we will talk about the 5 things to consider while buying a VR Headset, and then we will talk about the best 5 VR Headsets. You need to put in clear focus what you need the VR headset for. You need to determine whether you need it for serious gaming or watching movies or just want to feel the virtual reality. Since there are too many in the market, it is important to buy the one that fulfills your purpose at the best price. Are you depending on your PC so as to go for Oculus Rift or HTC Vive? Or is it for the console as in the case of PSVR? Do you need the one you can enjoy from your mobile phone? You must have to clear with the platform you are going to use the VR headset with. So, that you can choose the best one for your needs. Determine the accessories you’d need to have a satisfying virtual reality experience before you commit your money in a VR headset. For instance, would you need extra controllers? How much should you pay for a VR headset? This would depend on your budget and your need. You need to consider that before you pick up one. You must not be skeptical and have to think to find a good VR headset at the good price. It should not be the case that for saving money, you get one that doesn’t fulfill your needs. So, be sure about the cost and usability of the VR headset. You must realize that every VR headset has its strengths and weaknesses. You need to know the strengths and weaknesses of each one you consider before you buy to avoid a costly mistake and deep regret. 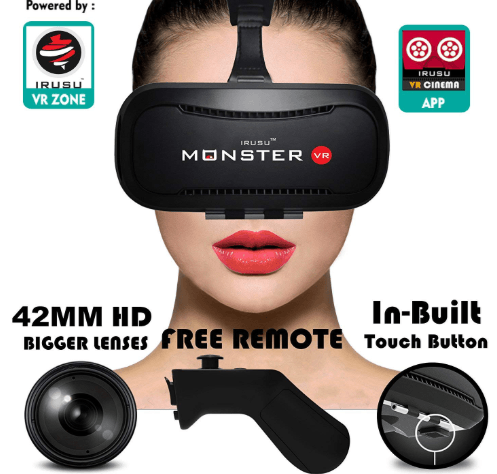 Irusu Monster VR headset with Remote Controller and Conductive Touch Button can be described as one of the best calibrated virtual reality headsets with its 42mm HD resin lenses. Its excellent design gives it the weight as light as 327 grams. You’re spared of excessive heat that the use of VR generates as it has a removable front panel with vents specifically designed to let the heat dissipate and give access to the mobile camera. It’s more easily controllable with a free Bluetooth remote. You would also love its fully adjustable lenses of Inter-pupillary distance (IPD) that enables you to fine-tune lens adjustment according to your eyes’ needs. It is definately one of the best VR headsets in India. The design is great and comfortable to use. Has a foam protector for face; preventing irritation or bruises of skin. It has high calibrated lenses for optimal view. The remote doesn’t work well with iOS 11. Q. Does it work with Oneplus 1? A: Yes, but it’s better to have Google VR app installed to enjoy a better experience. Q. Is it compatible with Samsung Galaxy? A: It might not, but it works with Samsung note 5. Q. How to know with which phones it will work with? A: If the phone has a gyroscope, this should probably work. Also, you should keep the size of the phone into consideration as well since it fits the best for the phones with 6.3 inches with dimensions under 170x80x12 mm. A bit smaller screen fits fine, but more than 6.3 inches phones won’t fit in this VR headset. 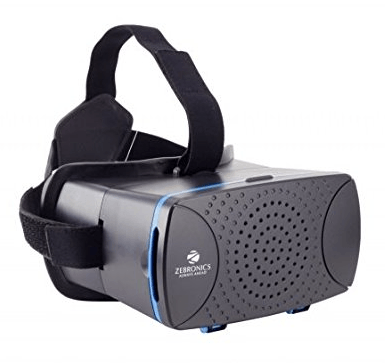 Zebronics ZEB-VR Virtual Reality Headset is a VR headset under 1500 INR that still gives you ultra-impressive motion-sensing game experience. It is compatible with the Google Cardboard and more comfortable and durable. It comes with an adjustable focal length and pupil distance together with an extra soft contact pad which gives hours of gaming comfort. You can’t overlook its powerful magnet trigger that is equally compatible with Google Cardboard. Its immersive VR game and 3D movies give all-round panoramic views of games, images, videos, life in its entirety. Its lens adjustment options are excellent. More comfortable to use, even with glasses. Contact Pad is quite comfortable that allows you to use it for longer hours comfortably. Can’t see edges of the screen in display movies. Though it weighs 322 grams which is similar to many VR headsets, customers have reported that it feels too heavy after some time of use since it puts pressure on the nose. Q. Does it work with laptops? A: It’s made to work with mobile phones. It can’t work with any screen wider than six inches. Q. Is it compatible with Nokia 5 and Samsung J7? Q. I have 6.5 inches sized phone. Can I use it with this headset? A: No, because it supports up to the phone size of 6 inches. This is a simple yet a high-quality VR headset that stands out in giving you the immersive virtual reality experiences. 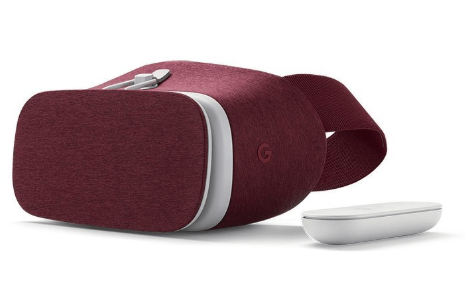 Google Daydream View VR Headset with controller comes with removable and washable face pad together with a trackpad that is included in 5-button Bluetooth controller. The controller can run for 12 hours if powered with 220mAh battery. It’s comfortable with the lightweight of 220 gram. You’ll enjoy using it with daydream-ready phones like Asus ZenFone AR, Google pixel, Moto Z/ Z Force, and Samsung S8/S8 Plus. Its interlocking system enables it to prevent injuries to the users. This probably the best VR headset in India but the cost is a bit more than others on this list. A one-year warranty is covering up to manufacturing defects. It’s comfortable for use even after long hours. The controller is not working for many buyers. It is a bit costlier. This gets hot when used for a bit longer period. The phone you use with it gets hotter while using. Q. Which of the iPhones can it work with? Ans: None. It’s designed to work with Android phones. Q. Is it compatible with MI Note 4? A: Yes. It’s best for MI Note 4. Q. Does the headset get hot or the phone gets hot? A: Many customers faced the issue of overheating of both the headset and the phone. Within 15-20 minutes of use, the mobile phone gets really hot as per some customers’ experience with it. 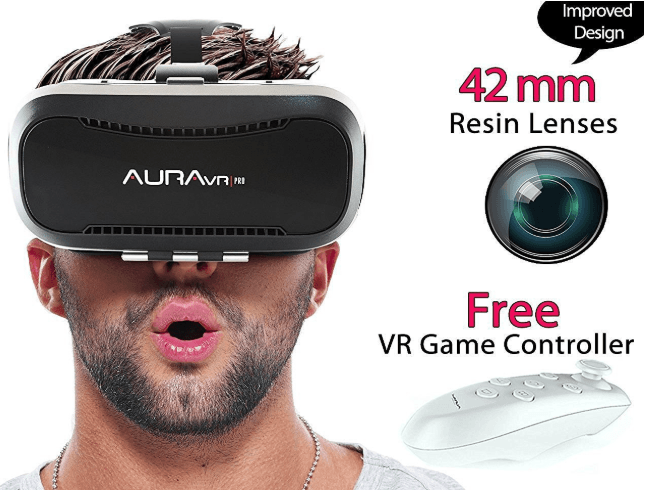 The AuraVR Pro VR Headset with Remote Controller with 42MM Fully adjustable VR glasses is an Indian product started by Ankush Agarwal that is enjoying impressive customer reviews. It’s designed from the finest plastic and this makes it more durable and lighter in weight. Getting the inspiration from Google Cardboard, the virtual reality headset can support mobile phones of various sizes from 3.5-6 inches. With it, you’ll be able to adjust the Inter-pupillary distance. With all of this including mind-blowing VR games, VR tours, and an endless array of quality virtual reality contents by means of your phone, you are in for an immersive VR experience. It works well with the majority of 3D photo and video apps. It comes with improved nano-coated 42 mm optical resin lenses. Lenses adjustable to suit users’ eyesight. Slot for android phones doesn’t fit comfortably for some mobile phone within range. Bluetooth remote doesn’t connect well with some android phones. Q. Is it possible to use an earphone while using the VR headset? Q. What’s the type of screen we’ll experience while watching movies in circular or rectangular? A: This depends on the movie, video or game application installed. This VR headset is amazing especially for Samsung Mobile phones such as S7, S7 Edge, Note 5, S6, S6 Edge and S6 Edge+. Since it is made by Samsung for its own smartphones, it gives great experience for watching movies and playing games. However, its compatibility is with only selected Samsung phones which we have mentioned above. As per the customers’ response to this VR, this is one of the best in the market for Samsung phones. This is the best VR headsets in India for Samsung phones. Stylish and comfortable design that make you use it for longer hours without any problem. 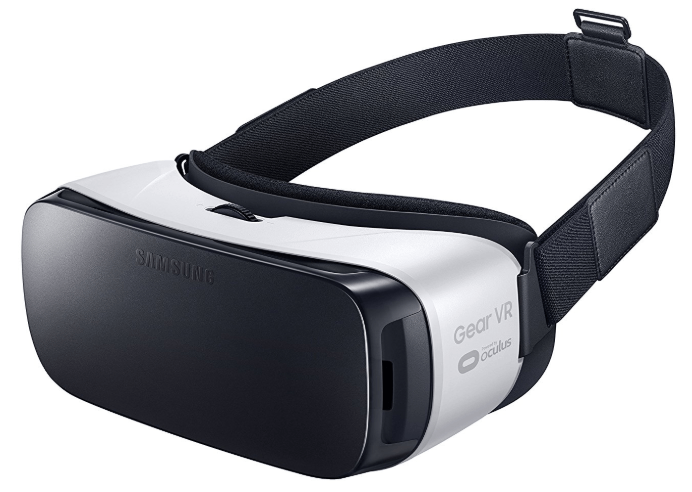 Only For Samsung especially, so other phone users won’t enjoy this amazing VR headset. Only works with S7, S7 Edge, Note 5, S6, S6 Edge and S6 Edge+. Not even other Samsung phone is compatible. So, if you are the owner of any of the above phones, you can then only enjoy using this VR. Q. Does it work with iPhone? A: Since it is designed only for selected Samsung phones, it won’t work with iPhones. Q. Does it work for PC? Q. Does it work with Samsung A8+? Many aspects of our lives are going virtual for example; we work online, we make friends online, and do many things online. We have great friendships with those people whom we never met. Virtual Reality is the future, and VR headsets are the best devices to enjoy virtual reality for watching movies and playing games. In this article, we have mentioned 5 best VR headsets in India that are of mid-price range, and they are good for initial VR experience. Later, you can go for costly ones as per your requirements. Hi… I have redmi note7. It has 6.3″ Screen size. Can you suggest me best vr headset for above phone. Thank you in advance.